Welcome to the home buyers section assisting buyers looking for Retirement homes in the greater Phoenix Arizona area. One of the top services buyers want from their real estate agent is help in understanding and maneuvering the Arizona home buying process. The information below takes you step by step through that process. Whether you are buying a full-time residence or a second home, the Arizona home buying process is unique in every state – and Arizona is no exception! Understanding the home buying process is the key to making it a pleasant experience and will very likely reduce the stress levels considerably! Even if you don’t read this whole article right now, don’t hesitate to use it as a reference at any point in the real estate transaction. You may find it helpful to print out as things can go very quickly once a contract is accepted. This article on the Arizona home buying process will be based on the assumption that you will be obtaining a mortgage to buy a home. Cash buyers can just skip the steps that don’t apply. The Arizona Department of Real Estate has put together an Arizona Real Estate Buyers Advisory Guide that gives you great information. It’s well well worth your time to review. Sign in as a guest to access. Here are the steps to the Arizona Home buying process. This is an important first step. When it comes to buying a home, you may be ready and willing, but you must find out if you are able! You may be in for a big disappointment if you skip this step. We can tell you from experience that it’s no fun to go out and look at resale homes and brand new homes, fall in love with one, only to discover you are unable to afford a home in that price range! Get a copy of your personal credit report. This can be obtained online or locally for a nominal fee. You can skip this step and let the Lender obtain it, but having it in your hand as you interview a couple of Lenders, is a real advantage – especially when it comes to sharing personal financial information with someone you are not yet sure you are going to do business with! Get pre-qualified. Choose a couple of Lenders that you want to interview. Some Lenders charge a very small fee for this, but most do not – especially if you have your own credit report! Call each one and as to get pre-qualified. Some Lenders will handle this over the phone and some will ask that you meet with them in person. In general, you can expect the lender will ask you questions about your income, your debts, and your assets. Be honest and accurate. Don’t be afraid to mention you are interviewing a few Lenders – they want to earn your business! Choose ONE Lender. After you have interviewed a couple Lenders, decide on one that you feel has the best to offer, and that you are most comfortable with. 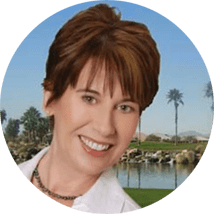 Choose an experienced Buyers Agent who specializes in the West Valley of Phoenix Active Adult Retirement Community real estate market. There are two sides to a Real Estate transaction – the Sellers side and the Buyers side. Typically the Seller lists their home through a Listing Agent using a Listing Agreement Contract. The Listing Agent is representing the Sellers best interest and focusing on negotiating top dollar for the Seller – the Sellers Advocate! A Buyer can contact the Listing Agent about their listing, but in doing so, there is a risk of a potential conflict of interest for the Listing Agent. The good news is that the Buyer has an advocate too, in the form of a Buyer’s Agent! The Buyers Agent is representing the Buyers best interest and focusing on negotiating the home for the least possible price! There is no fee to the Buyer for this valuable service. At the very least you will be well represented by your own Realtor! And it is highly documented statistically that in almost every Real Estate transaction, a Buyer’s Agent will save the Buyer money. Be sure to choose a Buyer’s agent that specializes in the the area’s Active Adult Retirement Market and more specifically the communities you are interested in like Sun City West, Sun City Grand or PebbleCreek. After you have chosen your Buyers Agent, talk to you Mortgage Lender and have the loan officer provide you with a Loan Status Report (LSR). Another option is to have your Lender email it directly to your Buyers Agent. This is an important document that will be necessary at the time of writing an offer on the home of your choice. Your Buyers Agent will need a copy of the LSR before presenting an offer. Discuss with your Buyer’s Agent the communities that interest you and your criteria. They should be able to provide you with details on community CC & R’s and community HOA fees. You will find that every community is different. a) With HomeSnap you will be able to take a photo of a house with your smart device and get all the current MLS information. It will also show you homes close by that are for sale. When taking a photo be sure to stand close to the house on the sidewalk as it will pick up the closest house. Click here to sign up for HomeSnap. a) In my experience, the average is 5 – 20 homes before Buyers find what they are looking for. Keep in mind that this is just a guideline, and it could be less and it could be more. b) How quickly you find the “right” home depends a lot on how strict your search criteria is and the current market conditions. Purchasing a home in a Buyer’s market is FAR different than purchasing a home in a Seller’s market. If you are considering a short sale or foreclosure talk to your REALTOR about the pros and cons. c) Trust your Realtor, and listen to your Realtors recommendations. Just like you do with your job, your Realtor lives and breathes Real Estate day in and day out every day of the year. It’s extremely unlikely that you or your friends or relatives, know the local real estate market better than your Realtor! Use your Realtors knowledge and experience to your advantage! All offers to purchase a home should be in writing. Realtors have a saying; “verbal means nothing”. Terms and Conditions are not legally binding unless they are in writing. a) Offers are typically written on an Arizona State approved Purchase Contract, which is 9 pages long! b) There are additional documents that are incorporated with the Purchase Contract, so please expect at least 2 hours to write an offer. c) Bring your Checkbook or be prepared to wire funds after contract acceptance! Typically you will give your Realtor a check for what is known as the Earnest Money or Earnest Deposit. The check is usually made out to Title Company of your choice. The money is applied towards your down payment at Close of Escrow. Your Realtor will explain this in more detail. d) After all documents pertaining to the written offer are complete, it’s the Buyers Agent right and obligation to present the Buyers offer to the Seller by going through the Listing Agent. Ideally, the Buyers Agent is obligated to present the offer in a face to face meeting with the Listing Agent and Seller. However, this scenario requires the Sellers written permission and is less common in our area. More commonly the Buyers Agent will email the Offer and all pertaining documents to the Listing Agent. The Listing Agent will then present the Offer to the Seller. Contract negotiations between the Buyer and Seller are strictly done through the Buyers Agent and Listing Agent – much like the function of a Lawyer in legal matters. All contract negotiations should be done in writing. Remember, in a real estate transaction, verbal agreements mean nothing! a) When an Offer is presented to the Seller, the Seller is given a specific time frame to reply. The Seller has three choices when receiving an offer. b) In the event there is a Counter Offer, the Buyers Agent will present it to the Buyer. The Buyer is given a specific time frame to reply. The Buyer has three choices when receiving a Counter Offer. c) At some point in this process either an acceptance or rejection will be achieved. Rejection means going back to step 4. Acceptance means to proceed to the next step! d) Once buyer and seller agree to terms and all parties have signed you are under contract. Both Buyer and Seller are legally bound by the terms and conditions agreed upon in this contract. a) The Escrow Period begins at Contract Acceptance and ends at the Close of Escrow. Close of Escrow (commonly referred to as COE) is technically the moment the home is legally recorded in your name. However, the phrase “Close of Escrow” is used often to refer to the final stages of closing the transaction (details in step 8). b) A Title Company is employed to essentially take care of the accounting part of the Real Estate transaction. They function as an unbiased party in the transaction, using the existing terms and conditions of the Purchase Contract as the Escrow Instructions. An Escrow Officer will be assigned to handle your transaction, with assistance from their associates. c) There are a number of fees incurred by the Escrow or Title Company. The party responsible for paying some of these fees is negotiated and agreed upon in steps 2 and 3.
d) During the Escrow period, both Buyer and Seller will receive many pertinent documents relating to the transaction. Contact your Realtor and Escrow Officer for guidance and recommendations as to how to properly fill these out. e) Some documents from the Escrow or Title Company may require the Buyer and/or the Seller to employ a legal professional or tax professional. However, this is more common when there are complex personal legal and tax ramifications involved. The party employing these services would pay the cost. 8. Time is of the Essence – means that there are specific time frames identified in the Purchase Contract that are strictly adhered to. “Days” are calendar days unless otherwise noted. a) Escrow opened at the Escrow or Title Company and Earnest money deposited – typically within 24 hrs or one business day from contract acceptance. b) Buyer begins completing loan process upon contract acceptance. If not already done, Buyer will give money to the Mortgage Lender for ordering the Appraisal. c) Home Owners Association (HOA) documents delivered to Title. d) Sellers Property Disclosure Statement (SPDS) delivered to the Buyer within 5 days of contract acceptance. Buyer responds within 5 days. e) Insurance Claims History (or C.L.U.E.) delivered to Buyer within 5 days of contract acceptance. Buyer responds within 5 days. 9. Inspection Period – Buyer’s opportunity to perform any and all inspections that are material to the Buyer. Be sure to discuss the Buyers Inspection Period with your Buyers Agent at the time of writing the Purchase Offer. a) Buyers Inspection Period begins upon contract acceptance, and expires as identified on line 182 of the Purchase Contract. Typical Inspection Period is 10 days after Contract Acceptance. b) At a minimum, the Buyer will order and have performed a professional Home Inspection and Wood Infestation (Termite) Inspection during this time frame. d) Seller has 5 days to respond to the Buyers Inspection Notice. Any party in receipt of additional Inspection Period Notices has 5 days to respond to the other party. e) Buyer applies for Homeowners Insurance. If not done already, Appraisal should be ordered at this point. f) Buyer to approve/disapprove Preliminary Title Report within 5 days of receipt. g) Buyer to approve/disapprove HOA CC&R’s within 5 days of receipt. a) In the event of a low Appraisal, Buyer may elect to cancel within 5 days. b)If not done already, Buyer should finalize packing and moving plans. 11. Final Stages of Closing Escrow – The Closing Date is identified in the terms and conditions agreed upon in the Purchase Contract. a) Buyer should arrange for utility company connections to be placed in their names 10 days to 2 weeks prior to the Close of Escrow date. b) Buyers Final Walk-through should take place 3-5 days prior to the Close of Escrow date. Seller to have all repairs that were agreed upon in the Inspection Period completed by this time. c) No later than 3 days prior to Close of Escrow date, Buyer will review the Final Settlement Statement, sign loan documents, and deliver closing funds to the Escrow or Title Company. In Arizona the buyer and seller do not sign loan documents at the same time and most likely never meet. 12. Close of Escrow Date – This is the day that the Escrow or Title Company will properly disperse funds and Record the new Deed, to complete the Real Estate transaction. Recordings are now done electronically and can be at any time of day up until 5:00 when the county recorder’s office closes. A sale can record at 4:59 on the day of closing. a) Title Company properly and officially disperses Buyer and Seller’s funds. b) Title Company will record the new Deed in the new Buyer’s name, with the County Office where the property is located. c) Title Company or their real estate agent will notify the Buyers Agent that the recording has taken place. d) Buyers Agent will notify the Buyer, and arrange for house keys (and garage door openers – if applicable) to be delivered to the Buyer. CONGRATULATIONS! The Real Estate Transaction is behind you and it’s time to move into your new home! 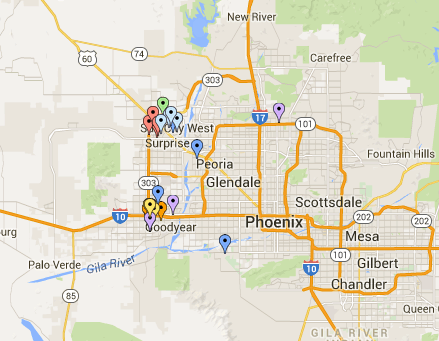 Hope you have found this article helpful on the Arizona Home Buying Process.